The #DearMe trending on Twitter caught my attention the other day. This was part of Women’s Day, where women wrote letters of advice to their younger selves. This got me thinking, what advice would I give to my younger writerly self? 1. Don’t let everyone tell you that bad writing and atrocious spelling means you cannot write. Dyslexia may be a problem, but computers will largely get you over these hurdles (cannot remember the last time I wrote anything, other than a card, by hand). 2. Learning to tell a good story is never wasted, and is the hardest thing about fiction writing. 3. Take up writing as a serious hobby much earlier – you are good at it. 4. Read only those books / article on writing that make a real difference (I’ll send you a reading list through the time machine). 5. Good characters are the key to creating great writing. 6. Practice writing lots – one day it will save your life. 7. Don’t go to the 2005 Winchester Writing Conference, you were nearly too late for that important thing. I know it was good, but save it for another year. What were you thinking? 8. The internet will change everything. Self publishing will no longer be just a vanity project, but a valid career move, where success depends not on luck, but on hard work. Get on the band-wagon early. 9. Outsource what you cannot do yourself. 10. Twitter is fantastic, why did you ignore it for so long? 11. Don’t bother with Facebook, you don’t ‘get’ it. 12. 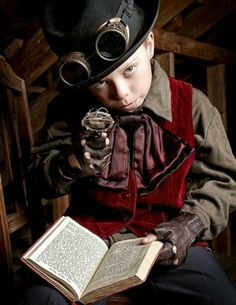 Love Steampunk. I know it sounds geeky and they dress weird, but it’s the story world and audience you are craving. So that is twelve things I would have liked to hear when I was just starting out as a writer. What about you? What advice would you give to your writerly self? #DearWriterlyMe.